Rockin’ and Golfin’ and Wipin’ Out! Sometimes, I go traveling to explore new places, or to go to a familiar place that I haven’t been to in a while. And then sometimes I go because one of my favorite bands is playing somewhere in Florida, as was the case this past Saturday. The Smithereens were playing at the Edison Festival of Light in Fort Myers. It had been 13 years since I last saw them, and I could not wait to see them again. If you don’t remember them, they had a couple big hits back in the late 80’s with “A Girl Like You” and “The Blues Before And After.” Having already seen them about 5 times before while living in Virginia, I knew what kind of show to expect. But I didn’t expect the lead singer to have eaten so much in those 13 years since I last saw him. He was never a lean man by any means, but always looked like he kinda took care of himself. But when he stepped out onto the stage, I couldn’t believe my eyes. At first, I thought he was a roadie setting up the mic stand. Amazingly, that rather obese man was the singer. I felt very disappointed and sorry for him at the same time. But on the plus size…I mean, side, he sounded great and the Smithereens totally rocked the place. Since the concert was in the afternoon, I spent the morning playing a couple rounds of disc golf on the beautiful campus of Florida Gulf Coast University, also in Fort Myers. For those of you who have not heard of disc golf, it’s also known as Frisbee golf, and involves the same strategy as ball golf. But instead of getting the ball into the hole in the least amount of strokes, the object of disc golf is to get the disc into a metal basket in the least amount of throws. Sounds easy, huh? This particular course is relatively new, and the first five holes border a gorgeous lake, with a small beach area usually teeming with sun-bathing students. I then headed to the downtown Fort Myers area, where I walked around a bit before the band went onstage. After the show, I headed south to Bonita Springs to play a couple more rounds at the disc golf course there. Usually, after I play this course, I head out to Bonita Beach to watch the sunset. And had every intention of doing so again. Except the skies got extremely gray and overcast, and there was no sun to see set. I headed back home disappointed by this, especially since I was hoping to have dinner on the beach. Not the way I wanted to end a fun-filled day of music and golf. But at least I got to see the Smithereens again. I had planned to go to Fort Pierce on Sunday to go hiking, but a good friend invited me to go mountain biking, so I ended up at Oleta River State Park in North Miami. Now, I do a lot of road biking on my ten-speed, but this was only my second time going mountain biking. And this may very well be my last time. The trail we went on tore me up. They should rename that trail “Wipeout” cause that is all I did the whole time. I had a couple bad spills in which I couldn’t even walk for a minute or two until the pain slowly subsided. I also figured I’m in pretty good shape since I go road biking so often. That theory was quickly proven wrong, as I was dragging big time only halfway through the trail. I was hating life, but very proud of myself for finishing the trail all in one piece. Let’s just say I spent the rest of the day recuperating. Maybe I should have gone to Ft. Pierce after all – hey, there’s always next weekend. Man, I am pooped just reading about your weekend! This site is very cool. The photo’s are great and I know for a fact that you have done all that you’ve written about. Great website. 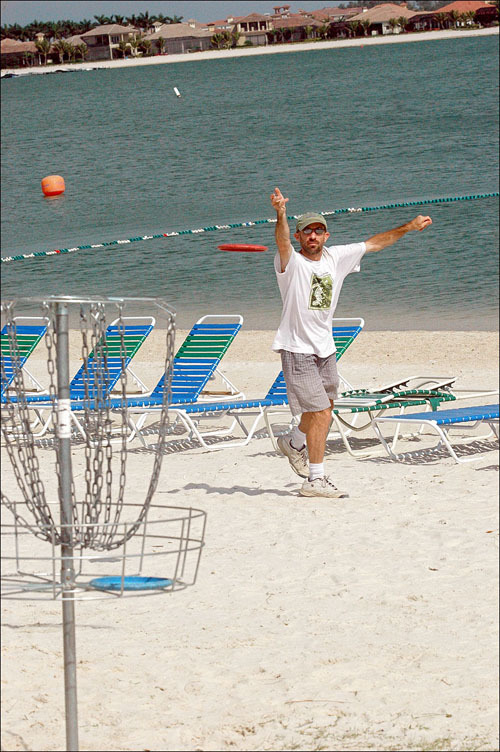 I have played both of the disc golf courses you mention here (Bonita Springs and Gulf Coast U). I will be back in the area in late March and would like to play again. Do you know if either course has a league night or the name of a Disc Golf Club to contact about that info. I liked the Smithereens back in the day also. I’ll keep an eye on your site and look forward to being back in Fla. I don’t know about the leagues at Bonita Springs and Gulf Coast University, but you can probably find out online.